CCEDNet-Manitoba has, in response to the City of Winnipeg's invitation for pre-budget submissions, provided recommendations that bring a CED perspective to the 2017/2018 budget. The recommendations below are based on policy resolutions that have been endorsed by our membership. The first recommendation calls for a comprehensive Winnipeg poverty reduction strategy, and the recommendations that follow would be well situated within such a strategy. Partner with community-based organizations and key stakeholders to create and implement a comprehensive poverty reduction strategy with targets and timelines. Create and resource a Winnipeg Food Council that will work together to ensure a fair, sustainable, and vibrant food system for our city. Use City planning, regulatory, and financial tools and powers to support at least 350 new units of affordable rental housing and 350 new units of social housing over the next three years. 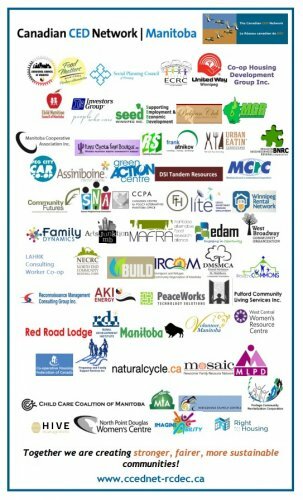 Continue to fund the Housing Rehabilitation and Investment Reserve or subsequent relevant budget reserve and develop a regular and transparent process for reviewing and adjusting its size to ensure it successfully enables the creation of an adequate supply of affordable and subsidized housing in Winnipeg. Adopt inclusionary zoning to increase the number of affordable housing units in all housing developments. Establish a policy for all surplus land disposals that ensures non-profit and cooperative housing providers are prioritized for receiving surplus land for the purpose of creating affordable housing. Contribute core funding to Winnipeg’s Neighbourhood Renewal Corporations to help achieve the goals in OurWinnipeg. Implement a procurement strategy that takes into account the added economic, social and environmental value of purchasing. This procurement strategy should target social enterprises that are creating jobs for people facing barriers to employment. Partner with community stakeholders to develop and adopt a Living Wage Policy for municipal employees and contracted services.